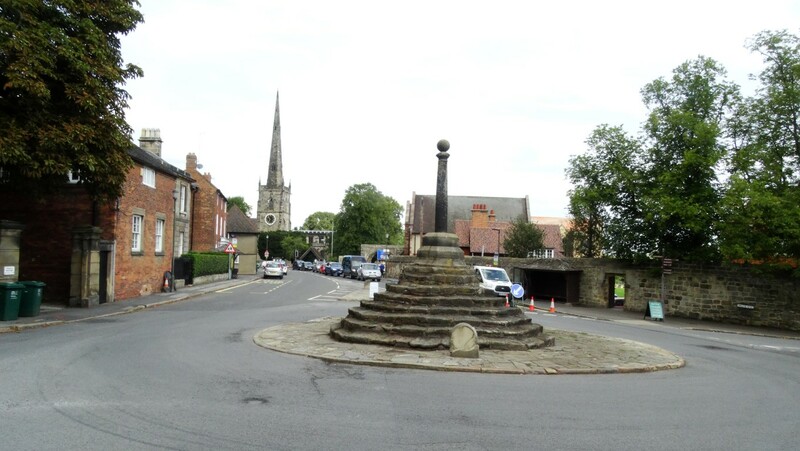 Repton Market Cross marks the centre of the village. Repton is a fascinating place and has a long history. Today this large village is dominated by its famous school. 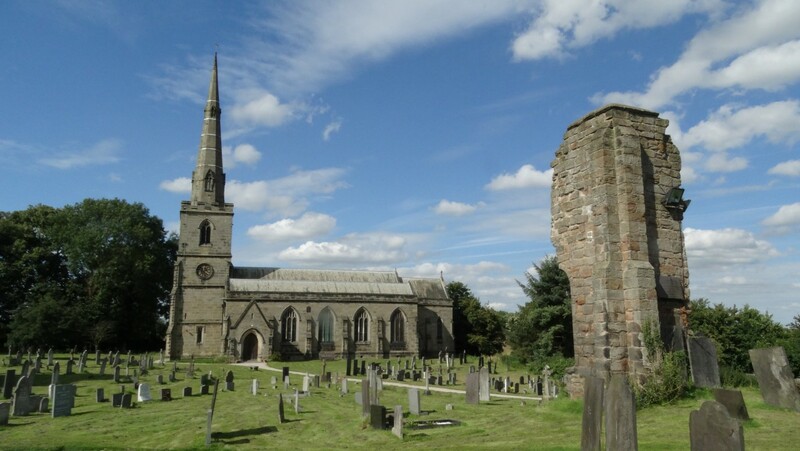 Founded in the 1500’s the school was built following the bequest of Sir John Port of Etwall who died in 1557 on condition that students prayed daily for his family souls. Repton Priory was to be the location for the new school in 1559 but for the following century there were lawsuits between the local landowner and the school which were only resolved out of court in the middle of the 1600’s. The church of St Wystan is famous for its Saxon Crypt which is said to be one of the most precious survivals of Anglo-Saxon architecture in England. The crypt was forgotten about for many centuries and was accidently rediscovered when workmen digging a grave stumbled upon it. It is thought that three Royal Saxon King’s were buried here. For my walk I started out by visiting Repton Church as I was keen to take a look at the crypt. Being a August bank holiday, the school was closed and hence the village relatively quiet. I headed out of the village on the Milton Road and soon turned left on a side road before taking a path east over Askew Hill where I went in search of the trig point which I found easy to locate. The path east however ran alongside a field of tall maize before cutting across another field of even taller maize with a path only just wide enough to get along. I was just glad that this crop wasn’t wet. I next had some road walking east to Windmill Hill where I turned left a little too soon and had to back track before taking the correct path towards Anchor Church. Anchor Church is not so much a church but a series of caves hewn into the cliff face and once thought to be the home of a hermit. This path later ran below a low cliff which was once the southern bank of the old course of the River Trent. Further on, the cliffs were higher and directly overlooked the river. The downside here was the dense growth of Himalayan Balsam. I wanted to explore Anchor Church which is not really a church but a series of small caves hewn out of the conglomerate sandstone rock. The name is thought to derive from the Anchorite hermit St Hardulph who lived here in the 6th or 7th centuries. 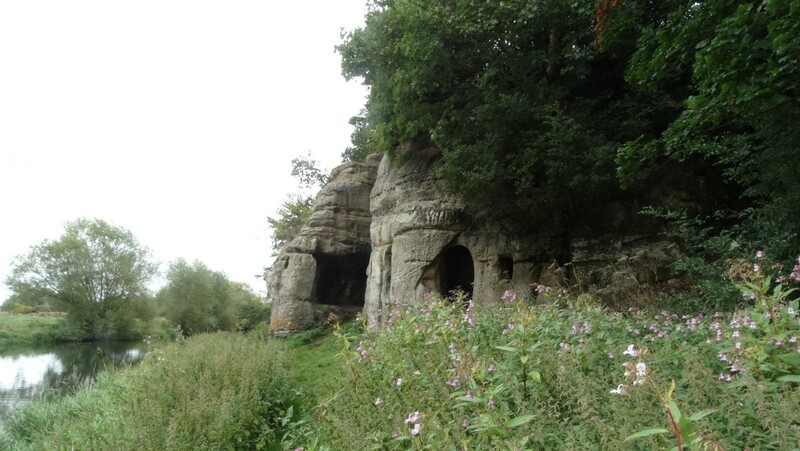 In the early eighteen hundreds the caves were enlarged by the then owner. Setting off once more I had to make a short but steep ascent up a slope to the cliff top and walked along the edge with a steep drop to my left before briefly descending to the river again. Beyond, a pleasant path led to the road at the small village of Ingleby. 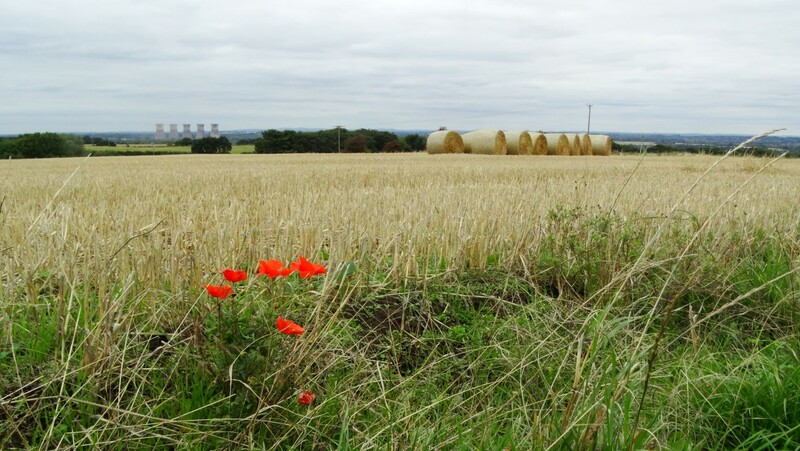 Poppies line the edge of a field south of Ingleby with a distant view across the Trent Valley. From here I set off south towards Ticknall on pleasant well defined paths with some views back over the Trent Valley. On the way I passed Knowle Hill, once an Italianesque pleasure garden which was created around 1700 and was designed to blend in with the local landscape. Today only a cottage and the summerhouse survive and the premises were acquired by the Landmark Trust in the early 1990’s and partially restored. After crossing a few more fields full of swallows darting here and there and passing through woodland blocks I arrived at Ticknall. A brand new wooden seat was a good spot to stop for lunch. 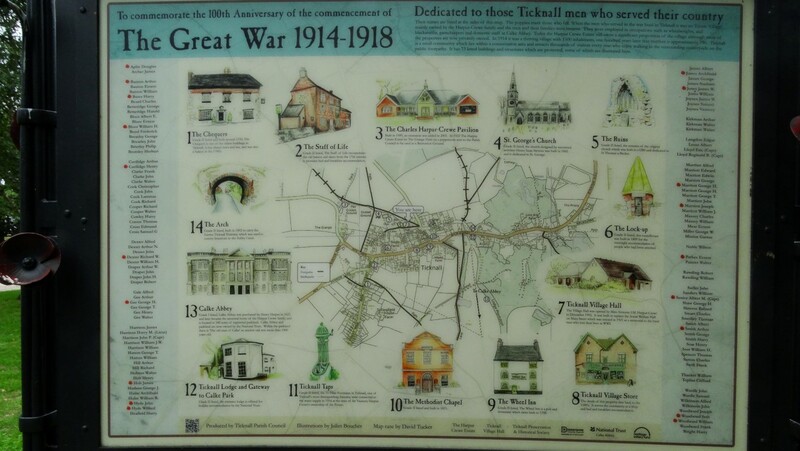 A display board in Ticknall depicting a wealth of historical information. 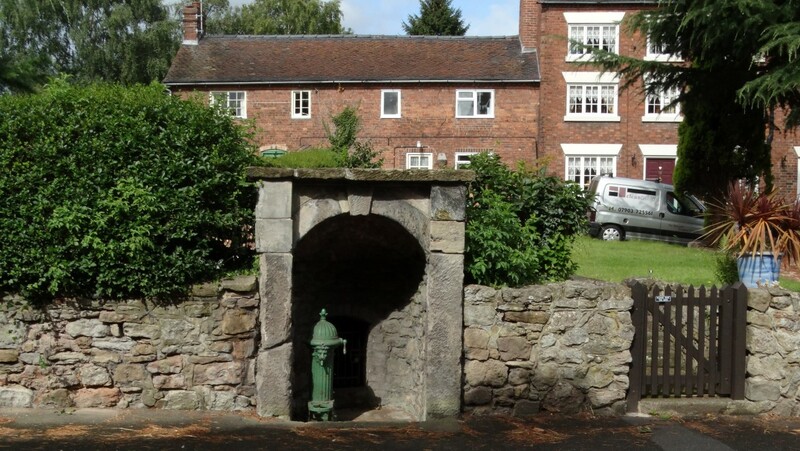 Ticknall was originally the estate village of the nearby Calke Abbey and the area has a long history of brick-making. Afterwards, I headed into the village passing on the way one of the ‘Ticknall Taps’ which the village is famed for. Around the village is fifteen such water spouts, each are an identical cast iron green spout with a lion emblem on them. They were part of a public water supply installed on the instruction of Sir Vauncey Harpur-Crewe in 1914. I decided on this occasion to visit the village church which was built around 1842. In the churchyard are the ruins of the medieval church which fell in to disrepair and rather than restoring it, the Victorians built a new church and blew the old church up leaving just a few ruins among the gravestones. So what do you do with a redundant medieval church in the churchyard – well the Victorians simply blew the old church up leaving these remains. One of the unique village pumps in Ticknall. Heading northwest from this fascinating village, I set out on the National Forest Way. I had walked this path in the opposite direction a year earlier and today I paused here and there to pick a few blackberries. 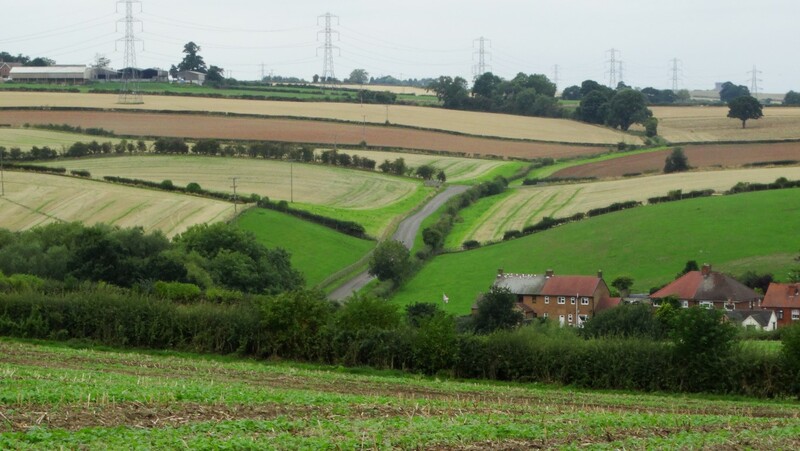 With a colourful patchwork of the ploughed fields, the afternoon had turned quite grey and it felt that summer was over as I trekked through pleasant countryside and later crossing a road south of the village of Milton. I continued west on a field path before turning north passing historic Ridgeway Farm and its listed dovecote on the outskirts of Repton. At the Mount Pleasant Inn, I turned left down a hidden enclosed path before turning right on a path through an overgrown area and passing a fine apple tree on the way with much fruit ready to pick. Another hidden path was followed into the village to complete a very rewarding walk. Gently rolling countryside and patchwork of colours is a typical scene in this area. ‘Take your pick’. 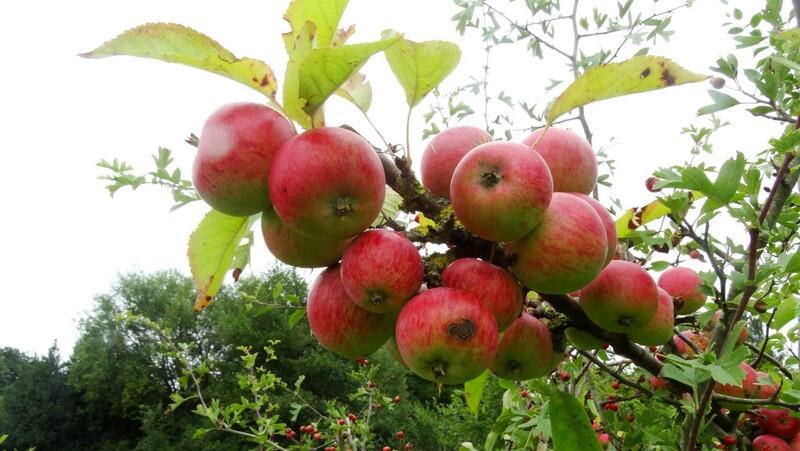 This apple tree in a long gone orchard was loaded down with fruit as I neared Repton towards the end of my walk. I am repeating this walk on the 6th April with one or two small variations so why not join me on a walk full of fascinating history. 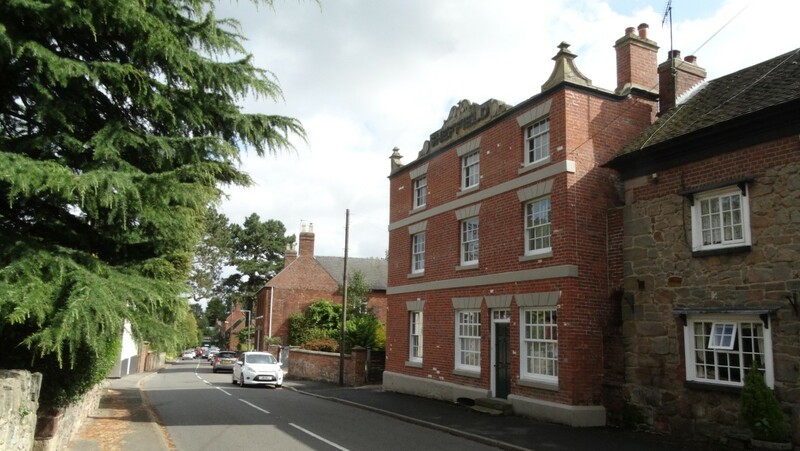 In Ticknall we will divert to visit the old lock-up and will view Sheffield House which is not all that it seems. Sheffield House in Ticknall. Find out why this house is not all it seems when you come on my walk.